Hits metal barrier surrounding pitch at speed. 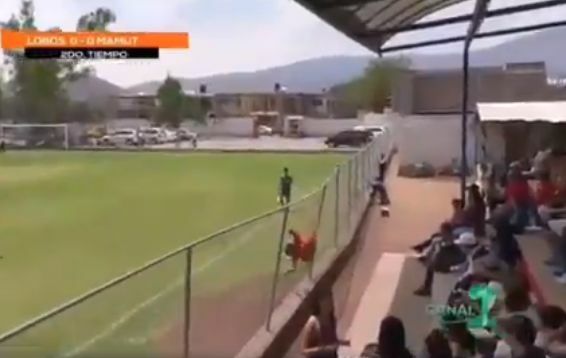 This weekend saw a dramatic goal celebration in a Tercera División de México group when one player jumped into a fence at speed following his successful strike as Lobos de Zacoalco faced Mamut. Lobos de Zacoalco number ten Ricardo Alves scores before running directly towards the metal fence surrounding part of the pitch. Slapping a teammate’s hand in anticipation along the way, the player’s goal celebration culminates in him throwing himself right into it. Apparently unhurt, goalscorer Alves gets up, dusts himself down and continues with the game.